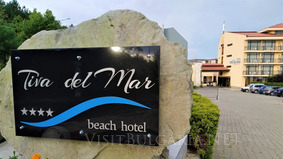 Location: Caesar palace is situated very close to Sunny Beach, between St. Vlas and Elenite resort, on the front line, next to the nice sandy beach. Accommodation: Caesar Palace offers 16 two-bedroom and 36 one-bedroom apartments, 9 studios, 25 double rooms and 3 two-level apartments. All of them are fully furnished and equipped to the highest standards. Room Facliities: All of the hotel rooms have kitchen facillities and offer unique view towards the gulf and the Old town of the nearby Nessebar resort. Caesar Palace has two nice restaurants with panoramic terrace, an Irish pub with karaoke, darts and billiard. There are also two swimming pools, sauna, jacuzzi, sauna, massage, pool and beach bar, and a nice kindergarten at guests' disposal. The complex has 4 guests' lifts and 2 lifts for room service. It provides special access for invalids. Nearby the hotel there is a beautiful green park, offering natural atmosphere for the guests to relax and enjoy their holiday.